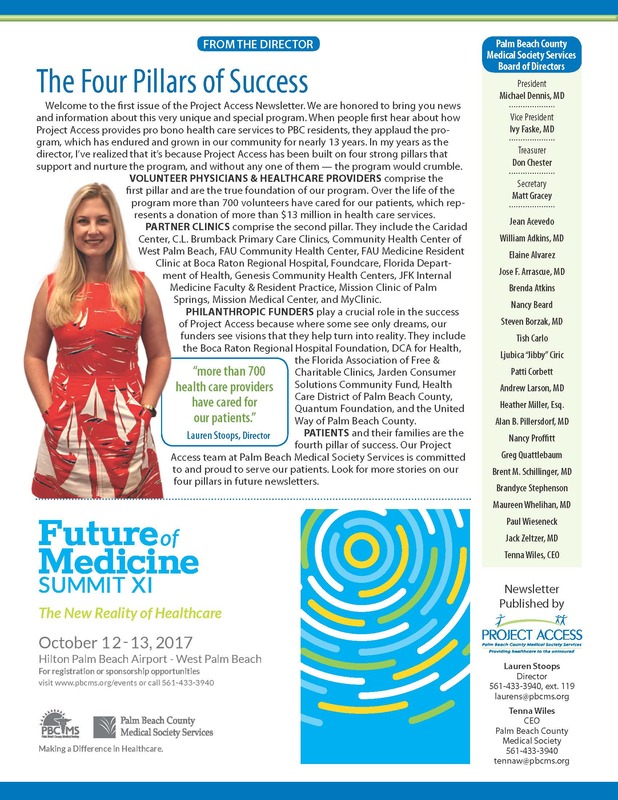 Project Access is a coordinated system of volunteer physician care, hospital care and diagnostic services for the low-income uninsured residents of Palm Beach County. The program is administered by the Palm Beach County Medical Society Services, Inc., a 501(c) 3 corporation. The program also provides free preventive, personalized care and focuses on wellness through prevention and early detection of Diabetes, Hypertension and Heart diseases. Project Access provides a short term plan with a long-term solution. While patients are under Project Access care, the staff works with them to find other ongoing care within a 1 year period. The program does not assist people who need emergency care. These individuals are advised to present themselves to an Emergency Department at a hospital. The program does not cover people who are underinsured. The program does not provide assistance retroactively. The mission is to obtain access to health care for the uninsured residents of Palm Beach County. Over 700 volunteer physicians and providers have participated. The program has served over 11,000 individuals with medical needs and found a long term healthcare plan for them. The program has donated a total value of over $11 million, an average of $1.2 million per year. Be a resident of Palm Beach County. Have income that does not exceed 200% of the Federal Poverty Level. Not qualify for any federal, state or county health coverage. If income level is met, call Project Access at (561) 433-3940 to be screened for eligibility. If accepted as a Project Access patient, staff will schedule an appointment date and time. Complete Project Access application form and bring to your appointment (No applications will be accepted by mail, fax or email). Project Access Spanish application. Proof of income will be required. The program enables physicians and other healthcare providers to provide pro bono care to needy patients in the community through an organized system that is simple and protective of the providers. Our professional staff will track your contributions and offer assistance to ensure a smooth, rewarding experience. Physicians are eligible to receive up to 5 CME every two years for providing pro bono care. The physician and facility has complete control of the number of patients they will accept. We do not ask for a minimum commitment. 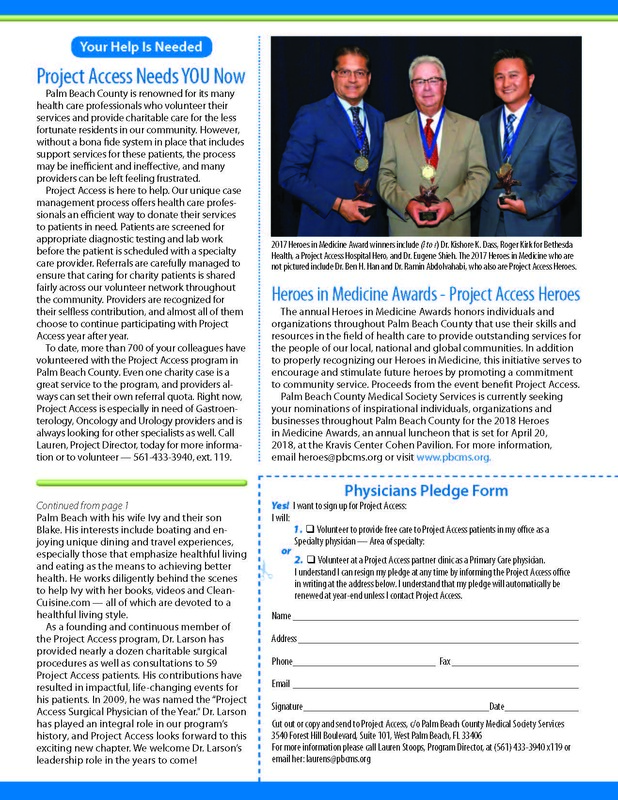 Highlight on physicians or providers who demonstrate exceptional services. Please call Lauren Stoops, Program Director, at (561) 433-3940 extension 119. You can volunteer with Project Access. To learn more, please call Lauren Stoops, Program Director, at (561) 433-3940 extension 119. Thank you for your support. You gift helps deliver health care to Palm Beach County citizens who have nowhere else to turn. 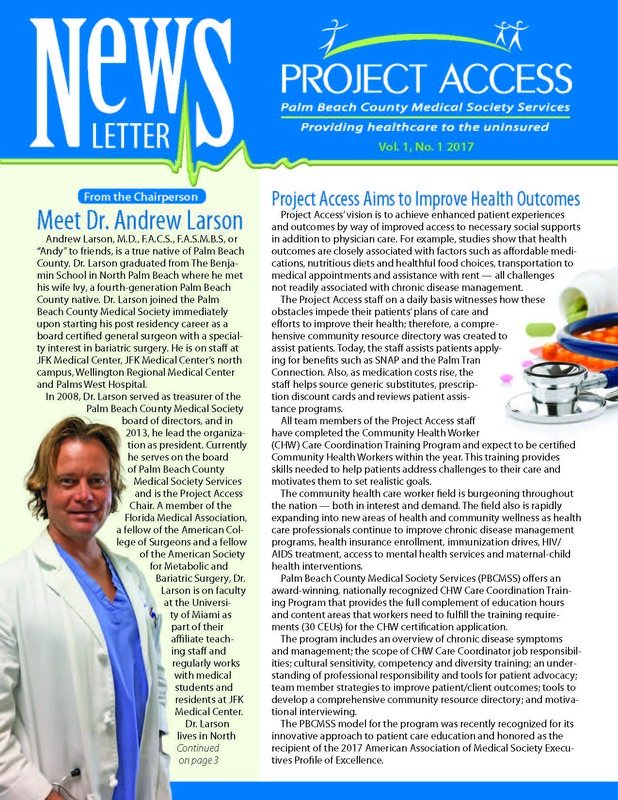 Project Access is a program of the Palm Beach County Medical Society Services which a 501 (c)3 organization meaning your donation is 100% tax deductible. For every dollar received we can provide $8 worth of medical care. 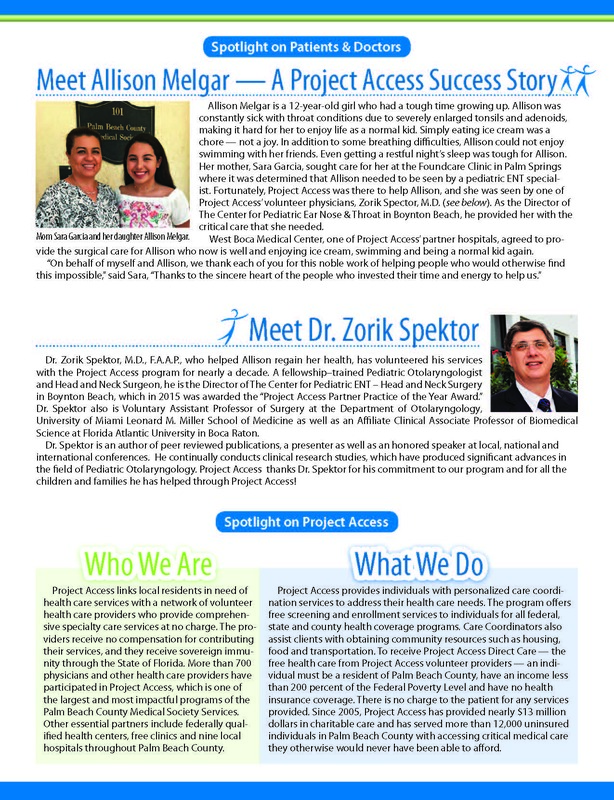 Project Access is a grant funded program through private funders and organizations. Do you want more information with Project Access and how we can help your community? Contact Lauren Stoops, Program Director, at (561) 433-3940 extension 119. We have navigation services to help you enroll into the Marketplace Health Insurance Plans. Contact (561) 433-3940.